Video: Good News Bus "Bus Life with 9" is HERE! We have been talking about doing a video for years and now it's here. 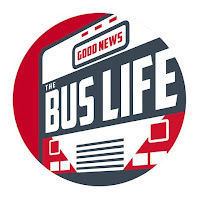 After months of filming, editing and more filming "Good News Bus: Life with 9" is now a reality and is available for viewing on YouTube and some local TV stations. We want to hear from you. Please comment on this post or in the video comment section on YouTube and let us know what you think. Also, if you share and like our video we would really appreciate it. Awsome! What you did with the wood and lighting makes it look like a warm cozy place. Like a home.